I’m talking, of course, about the tax bill, the most sweeping overhaul of our nation’s tax code in more than 30 years. And it’s impact to your office isn’t about the corporate tax rate you’ll pay or your new personal tax bracket. 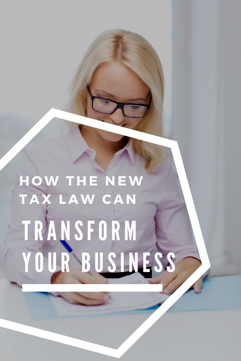 It’s about a once-in-a-generation tax opportunity and how you can help your clients take advantage of it. -- Fee compression: Fees across the financial industry are coming down, meaning you’re getting paid less for your work. Advisors are racing to lower fees as they compete with low-cost funds and robo-advisors, but the compression is not sustainable if you want to build a successful practice. -- The need to differentiate: It’s poor business strategy to make yourself the cheapest option on the block. So how can you differentiate yourself? How can you provide more value than other options deliver? The answer to both these challenges? Repeat after me: Tax-efficient income planning. Tax-efficient income planning is the biggest opportunity in our industry today, and those who are early adopters have a dramatic growth advantage. 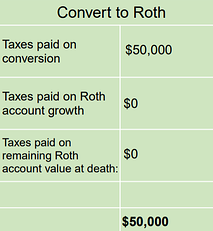 What do I mean by “tax-efficient income planning?” I mean helping your client get the most after-tax income from the most tax-efficient strategy. And I bet nearly 100% of your clients don’t want to pay more in taxes than they have to. For too long, advisors have looked at the risk balance or asset allocation of a client’s portfolio, but have overlooked the tax allocation of the portfolio. You’re about to change that. I’ll be blunt: In 2018, you need to focus on converting some of your clients’ tax-deferred assets into tax-free assets. And that’s where the new tax law has given financial planners a wonderful gift. The legislation artificially lowers tax rates for a limited time. Most of the household tax cuts expire in 2025, giving you 7 years to convert your clients’ assets at the lower rate. There’s urgency for your clients: the time to convert is now! How can you convince them? Step 1: Shock them with the truth. (By the way, you can run the tax analysis above for all your clients – it’s part of StonewoodFinancial.com’s client proposal software). Step 2: Give them a better option. Now that your client’s know the truth about tax deferral, give them a better option. 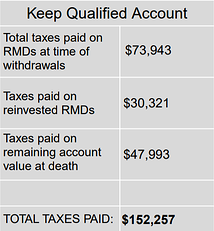 And here at Stonewood, we believe the most powerful tax-free option is Indexed Universal Life. Want to learn more? Click here and let’s schedule a time to talk. Get serious about growing your practice in 2018. We’ll show you how.